Welcome to the ‘New Year’! Old you, 2018 you, is feeling a little bit delicate. Like you spent two weeks overeating, overindulging on gin and not eating enough vegetables. Physically and mentally you are needing some TLC and the New Year is the perfect time to discover a New You…well a heathier take on you. Yes, it may be a time where publishers hope to sell life-makeover books but after too many pigs in blankets and the inevitable January blues why not use the start of 2019 to make lasting changes? It is all about taking realistic steps, otherwise you will try and fail to implement change. Let’s face it, diving in and thinking it likely that you will enlist a personal trainer, drink wheatgrass and do two hours of yoga a day is not going to happen. Happiness, health and fulfilment take time and work. Take our advice and kickstart that January feeling of fresh starts and clean slates with simple acts and the help of these useful products! The best buys to help you achieve the ‘New You’. Premium prepared food brand Charlie Bigham’s have just bought out a new vegetarian range, prefect for ‘veganuary’ when you might fancy giving up meat as part of your New Year’s resolutions. 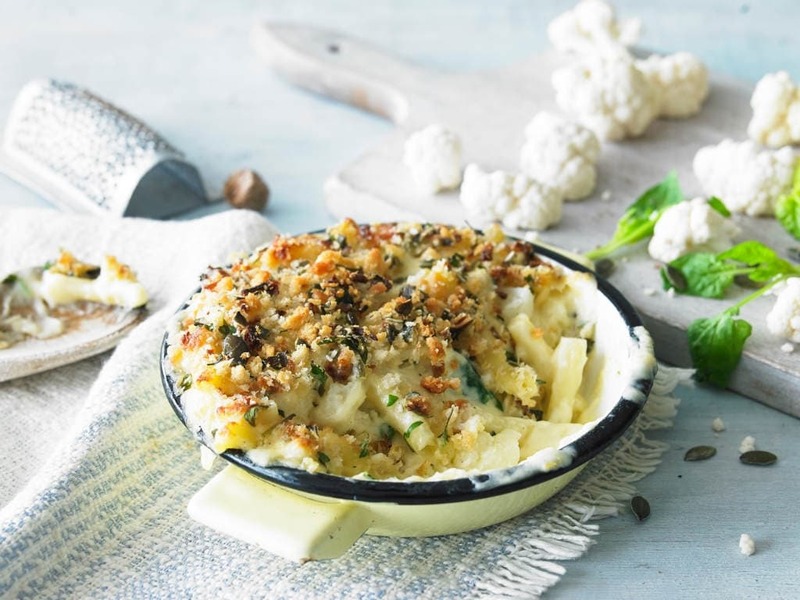 We love the delicious Cauliflower Macaroni Cheese. Perfect for two people and packaged in the brands distinctive wooden trays, the meals are made using the finest quality ingredients. As you simply pop them in the oven it is perfect for busy parents like myself who do not have time to cook new recipes from scratch. The food is comforting, restaurant quality but with a homemade taste. Relax in a spa, in your own home. There are thousands of skincare products on the market. But which do you buy? To treat yourself why not invest in Vie Healthcare’s Moroccan Hammam Spa gift pack. Take your senses on a voyage to the magic of Morocco and treat yourself to a Hammam ritual experience that leaves you feeling fresh and beautiful from head to toe. The beautiful bundle includes Rhassoul Clay (200g) from the Atlas Mountains: used as a Facial Mask, Cleanser and Shampoo. With an ethically sourced coconut spoon it is high in silica and magnesium, the clay absorbs toxins and impurities whilst moisturising skin. Suitable for all skin types, also included is Beldi Black Soap, a cleansing gel enriched with Eucalyptus oil to revitalise the senses and energises the skin and mind. With this comes an exfoliating textured Kessa glove that effectively removes dead skin cells, toxins and impurities. Last but not least is a bottle of Menara Argan Oil, rich in Vitamin E to leave your skin soft. At £18.95, you can just relax. For the avid draftsman or rainy-day sketcher Derwent are a brand for art lovers. The beautifully boxed A5 sketching journal set is the perfect companion, ideal for instant studies and retailing for £29.99. Take time out of a hectic day to grab the handy sized pad from your bag and capture the world around. Designed with practicality in mind the thread-bound spine opens completely flat; providing a level surface for you to draw on. Complete with an elasticated pen wrap and Derwent’s semi-permanent water-based Graphik Line Makers (Black 0.2, Graphite 0.3, Black 0.5, and Sepia 0.5) this set has everything you need. Now just to take yourself to the seaside or the local café to get inspired! If you did fancy a tipple. Many people tend to jump on the alcohol-free bandwagon for January. After a heavily indulgent festive season, it becomes a ‘dry’ month for some, and I don’t refer to the weather. Instead of an all or nothing approach I advocate moderation and will still be pouring myself a glass of red on the first Saturday of the New Year! Now, I learnt something new in being sent three tasty bottles of Proudly Vegan wine. With a focus on green living, ethical and environmental support and the growth in popularity of a meat free diet more and more people are looking at ways of changing their dietary habits forever. I, as I am sure many consumers do, assumed that wine is not made with animal products. Egg white, gelatine and milk protein can all be used in the winemaking production process. Registered with The Vegan Society, Proudly Vegan is the only wine on the high street which is 100% vegan, right down to the ink and glue on the label. Even better? The Rose, fruity Merlot and crisp Sauvignon Blanc are delicious. Reasonably priced at £6.99 it is easy to make the switch. January, the perfect time to start planning for the year ahead. The Dairy Diary has been Britain’s favourite home diary since 1982. The bestselling Recipe Diary comes in a range of beautiful, stylish contemporary designs which feature delicious weekly, triple-tested recipes which are easy to prepare and that everyone will love. They take advantage of seasonal produce! Basically, you get a cookbook and 12-month diary all in one. Layout preferences vary for diaries, personally I love the A5 sizing, and week-to-view diary which offers lots of space to write plus notes pages. Snacks that you can binge on. Recipe Diary have recently launched their new traditionally dried, super soft, ready-to-eat apricots which are ideal for munching on the go, perfect for popping into lunch boxes. Now you wouldn’t have thought that fruit would be a good chocolate alternative, but these are the tastiest apricots I have ever had. Packed full of natural flavour the apricots’ fibre content will keep your family fuller for longer and provide energy in between meals. The 40g bag contains two of your five a day and are a good source of antioxidants which offer protective benefits for your health and immune system. Suitable for Gluten-Free, Vegetarian and Vegan diets, the apricots contain no artificial additives you can’t go wrong. Stock up on the supplements. Vitamins play an important part in my and my children’s lives and it is important to buy from reputable brands. Since the birth of my daughter nine months ago my hair has thinned dramatically. Recipe Diary new Hair Volume Gummies are the UKs leading hair supplement. The sweet apple flavour means they are easy on the palate, packed with key ingredients such as millet, biotin and zinc. The gummies supply nutrients to the scalp and hair follicles where the hair is formed, they are also beneficial to the skin and nails. I like that they are chewable and don’t leave an unpleasant, lingering taste in the mouth. I challenge you to take them for a month and see the improvements for yourself! Peckish after a run or gym session? Why not grab one of Recipe Diary newly launched range of Superfood energy bars? Little, but filling and packed with flavour each bar supports slow energy release. The perfect source of fibre makes them the ideal, healthy on-the-go snack. The range includes 3 flavours, powered by nutrient-rich African superfoods: I liked the denseness of the bar, my favourite being the chewy Banana Boost with Baobab fruit. A source of copper, manganese and fibre it fights off hunger pangs and satisfies the rumble of a sweet craving whilst being sugar free! Those with allergies and intolerances can happily munch away as they do not contain gluten, wheat or dairy, with no preservatives or additives. If you needed any more excuse to buy them, every bar helps create sustainable incomes for rural African households, helping you make positive changes for yourself and others. Keep hydrated. Drinking water is one of the simplest steps in keeping the body and mind healthy, increasing energy and relieving fatigue. Recipe Diary is the ultimate partner to the New Year detox. Bottled at source in the Carpathian Mountain, the award-winning sparkling water is virtually nitrate free with a balanced mineral content. The crisp, pure and refreshing taste is perfect for rehydrating, on its own or with a dash of lime. They also produce a still natural mineral water that is naturally alkaline with no odd aftertaste. For the smallest hands and a perfect lunchbox size there is even a bottle (BPA-free) designed especially for children with a spill-proof sippy cap. I don’t know about you, but I feel thirsty. Whatever form you choose sometimes motivation can be hard to find, especially after 100 pigs in blankets. Sling ballet is something I am hoping to take up with baby Norah after years of not dancing. Whether it’s a new pair of yoga pants or headphones perfect for jogging little gifts can help encourage us back into our chosen sport. For the ballerina in the home why not invest in a Recipe Diary subscription? a luxurious gift for dancers at any age or level, filled with accessories from the industry’s most innovative brands. What I was really impressed with was the value of the contents. At £30 per month (with a quarterly, or one-off option available) the boxes can be fully personalised with the recipient’s size and favourite colours dance essentials and accessories. Give up all toxins this new year. With all the focus on pristine homes on Instagram #WhatisHinching?! Clear-outs after Christmas are often accompanied by a bulk buy of cleaning products. Alongside these lemon and bleach scented bottles are concerns over strong chemicals and bins full of non-recyclable plastic. If you are considering stopping smoking, then why are you not concerned about the toxins we are breathing in our homes? Even products marketed as ‘natural’ and ‘chemical free’ can still contain these nasties. TheRecipe Diary range of wellbeing and home cleansing products is a sustainable and bio-gradable collection of natural formulations that use the cleansing power of botanicals and essential oils to rid your home of dirt and germs. Promote the zero-waste movement and invest in these beautifully fragranced and stylishly bottled items, my personal favourite being the all-purpose cleaner. The only totally toxin-free home cleaning range currently available in the UK, they are also free from Palm Oil. Shine a light on January. Comfort, it means different things to us all. To me its an open fire and a soft blanket, candles flickering on the side of a bubble bath. In the home small touches can make big impressions. The popular Yankee Candle Company produces the most fragrant, decorative, beautifully crafted products, a brand that shines above others. Taking style to new heights, 2018 introduced a contemporary design to the collection, the Recipe Diary Elevation with Platform Lid. The pairing of the simple yet stunning tapered glass silhouette and functional, dual-purpose lid which acts as a platform for the candle while it burns is design perfection. Selling in three sizes the candles are adorned with watercolour illustrations and the wax colours will complement any room in the home. Grab a large 2-wick square candle for £23.99. Care for your hands and feet. We spend hours moisturising our face, use product after product but often forget our hardworking hands and feet. Each product soothes dry skin and is guaranteed to provide relief. From builders and contractors to gardeners and nurses O’Keeffe’s are the brand for those who rely day-to-day on their hands. What I love, aside from the non-greasy, non-slimy perfume free lotions are that you can buy in squeezy bottles. It is a pet hate using pots as dirt and other nasties can get in the cream. For £14.99, skin dried out from swimming pools or the air con in gyms will benefit from a gift pack with O’Keeffe’s Working Hands hand cream, Healthy Feet foot cream and Recipe Diary new Lip Repair lip balm. A sparkle in your ears as well as your eyes. New year means a focus on your body and mind, even your wardrobe will get an overhaul in the sales, but, jewellery? It can get forgotten. If you are feeling a bit lacklustre then why not add a bit of sparkle to a gloomy January with a specially designed and crafted piece from goldsmith and jeweller Recipe Diary Fall in love with the elegant simplicity of these Hummingbird ear studs. Measuring 10x9mm they sit perfectly in your ear! You’ll only know they’re there by their shiny sterling silver or yellow / rose gold vermeil wings glittering at your earlobe. At £69 they make the perfect pair for everyday wear. Tis the time of year to ‘spring clean!’ It’s a well-known fact that stuff and clutter cause anxiety. In busy family homes you cannot avoid colourful mountains of toys, clothes, homeware etc. Yes, you may threaten your seven-year-old to throw Batman and his friends in the bin, but let’s face it you won’t. What you can do is invest in innovatively designed, yet inexpensive storage solutions around the house to keep things spick and span. Recipe Diary is a UK based company that want to make life easier which leaves time for the things that really matter. Laundry overwhelms our home so for £17.99 a slim, lightweight laundry hamper that can hold 40L is ideal for fitting in tighter spaces and filling full of socks! Perfect for the sink side is the hard-wearing multipurpose caddy a steal at £5.99 for organising your washing up. Jump online and grab these goodies for your home and find a deal in the sales. Note: We were gifted these items for inclusion in this feature. All thoughts and opinions are our own #AD.